Please check your Cooley email (through the portal) and the portal calendar regularly! Please stop at the Circulation Desk for details and a Carrel Reservation Request Form. Mon – Thurs: 9:00 a.m. - 9:00 p.m. Sat: 12:00 a.m. - 6:00 p.m. If you need assistance locating material, please ask at the reference or circulation desk. We wish all of you a successful term! Remember, our job and our passion is to help you. INTERNSHIPS, LAW CLERK, EXTERN, ETC. The following are some of the local positions currently available for students in the Lansing area. For these and other positions, including positions in other cities and states, please visit your Symplicity page. Description: The Grand Rapids City Attorney’s office offers externships/internships year round. Externs/interns are trained and mentored by a senior attorney and are given court assignments from pre-trial conferences through trials. Externs/interns appear in court to prosecute misdemeanors and civil infractions. They will gain experience in both the 61st District and 17th Circuit juvenile court, from pretrial through trial. They will also participate in legal assignments involving legal research and writing. These projects include legal memos, motions, appellate briefs, and research for municipal ordinances. Applications are reviewed on a rolling basis and candidates are selected before the beginning of each new term: January, May, and September. If applying for the Extern positions, please verify your eligibility with the Extern Office. To Apply: See the instructions on Symplicity, posting 15135. Description: The Tribunal trains clerks to prepare summaries for small claims hearings, and instructs clerks on drafting various legal documents in accordance with Tax Tribunal Rules and the Michigan Rules of Court. Further, the Tribunal recognizes the importance of active learning, allowing law clerks to become fully engaged in the legal process by encouraging them to observe hearings where they witness the procedural and evidentiary concepts taught in law school. All students are exposed to the normal professional work load of a Tribunal Member and Administrative Law Judge. Work is further assigned according to the student's area of study, education, i.e., J.D., L.L.M. in Taxation, and performance. Qualifications: Prospective law clerks must have a cumulative GPA of 2.50 or better and have completed at least one research and writing course with a grade of at least 2.50. To Apply: See the instructions on Symplicity, posting 8808. Description: Law Clerks assist with general courtroom duties including arraignments, pretrials, pleas, sentencings, motions, and trials. This job requires people skills, communication skills, and the ability to multitask. To Apply: See the instructions on Symplicity, posting 9592. Description: Do you want to strengthen your resume by working for the Attorney General’s Office and reduce your student loans through work-study? The Michigan Attorney General’s Charitable Trust Section is accepting applications for work-study positions on an ongoing basis in its Lansing office, just two blocks from the Cooley Center. We are looking for 1L, 2L, and 3L students. You can work from 8 up to 25 hours per week and get compensated at the rate of $16.86 an hour. The Charitable Trust Section administers Michigan laws for registering charities, the Charitable Organizations and Solicitations Act and the Supervision of Trustees for Charitable Purposes Act. Students assist with reviewing of registration forms submitted by charities to ensure compliance with the applicable laws; updating Legal Files database; responding to phone inquiries; filing; scanning; opening mail. Additional opportunities may include providing legal assistance to the attorneys and assisting with the AG’s school safety initiative OK2Say. 1. Verify with your Financial Aid Office (Richard Boruszewski at boruszer@cooley.edu) if you qualify for work-study. 2. Send us your cover letter indicating how many hours per week you can commit to this position. 3. Attach your resume and unofficial transcripts (if first-termer, please provide your undergraduate transcripts). 4. Email your application materials to Joanne Gram at gramj@mi.gov and Inna Volkova at volkovai@mi.gov. Representatives from the Attorney General will be interviewing candidates at the Career and Job Fair. To Apply: See the instructions on Symplicity, posting 12983. Are you looking for ways to save money on tuition, books and living expenses? Why not apply for a scholarship or two. Scholarship money does not have to be paid back and is yours to use towards what the scholarship specifies. If you have more questions, please refer to the Student Services portal page and scholarships. Outside scholarships are being added on a regular basis. Monday - 9:00 A.M. to 6:00 P.M.
Tuesday - 1:30 P.M. to 6:00 P.M.
Wednesday - 9:00 A.M. to 1:30 P.M.
Thursday - 9:00 A.M. to 6:00 P.M.
Friday - 4:30 P.M. to 9:00 P.M.
Saturday - 12:30 P.M. to 5:00 P.M.
Sunday - 11:00 A.M. to 1:30 P.M.
Monday to Friday 9 A.M. to 9 P.M. There is still a "Cup of Joy" bucket near Ms. Vivian's desk. The SBA wants you to have an enjoyable day everyday! AND, there is still a "Suggestion Box" with a notepad and pen. The SBA would like to hear your concerns or changes you would like to see in Cooley. Please feel free to stop by if you have questions, and we will help you with your questions and concerns. *Later times by appointment only. Term Break Hours: 9:00 a.m. to 5:00 p.m.
For your convenience, a Locked Drop Box is located on the 2nd floor of the Cooley Center in the corridor directly across from the elevator foyer. If the Business Office is closed, please use this locked box to submit payments. Be sure to include your student number on the check. If paying with cash, place in a sealed envelope with your name and student number clearly printed on it. Located at 107 N. Washington Sq.,Sparrow FastCare Clinic is now open on weekdays from 7:30 a.m.-5:30 p.m.
for basic medical services and common, non-life-threatening conditions. 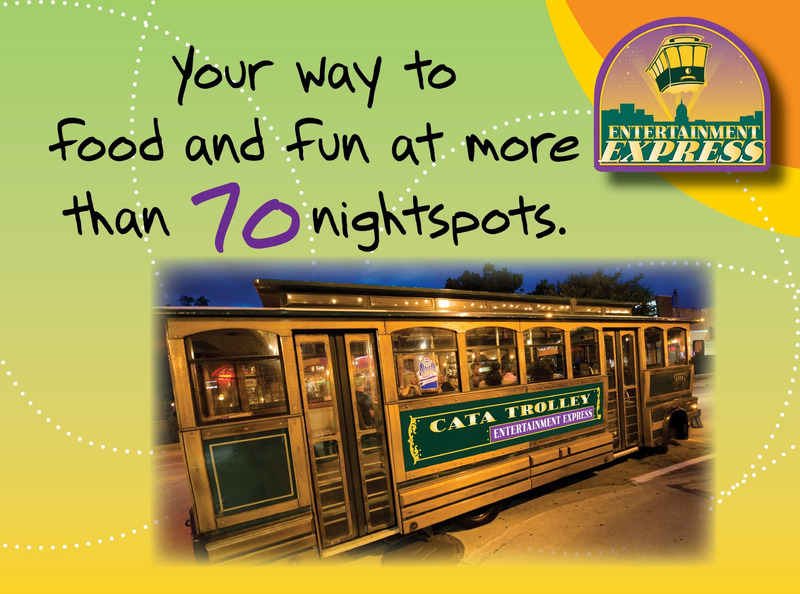 Catch the CATA Entertainment Express! 7:30 p.m. - 2:30 a.m.
And the Lansing Student Bar Association website Homepage. The e-newsletter provides information about Lansing campus activities, news, and deadlines. Wednesday is the deadline to submit information for publication on Friday. Information about services (like fitness classes, tutoring, tax prep, babysitting, etc.) may be posted on the portal Bulletin Board (under “Communities”) instead.